Sundance Square – October 1, 2018 — Circle Theatre is gearing up for their annual High School Playwriting Project and announcing a new partnership with the Girl Scouts of Texas Oklahoma Plains. Each year, the High School Playwriting Project begins with invitations to area high school teachers and students to enter 10-minute scripts for evaluation by an experienced panel of judges. Finalist Caroline Cabe talks to Director Alan Shorter during the 2017-2018 High School Playwrighting Project earlier this year. These judges read the anonymously submitted plays and choose 20 plays to send to Connie Whitt-Lambert, theatre professor at Texas Wesleyan University. The panel of judges is made up of local theatre professionals, including playwrights, directors, producers, teachers, and professors. 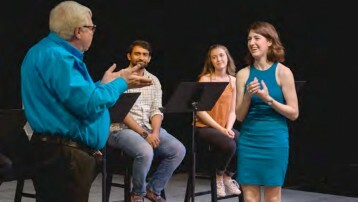 Additionally, Texas Wesleyan University is offering an academic scholarship to the finalist playwrights, should they be accepted to the university. Texas Wesleyan University will also provide a free workshop for participants on Saturday, October 20, 2019. If students would like to attend, please RSVP by emailing cwhittlambert@txwes.edu. The public reading of the finalists’ plays will take place at 3pm on Sunday, May 5th, 2019 at Circle Theatre. Alan Shorter will direct the readings. A reception honoring the students and their teachers will immediately follow the readings and awards ceremony. The public reading is free of charge and open to the general public, as well as families and friends of the playwrights. Finalist and semi-finalist students and their teachers will receive cash stipends, certificates, trophies, and complimentary theatre tickets as an acknowledgement of their participation and accomplishment. The 23rd annual High School Playwriting Project is sponsored by the Pangburn Foundation, JP Morgan, Trustee and the David and Betty Sacks Foundation. Circle Theatre is teaming up with the Girl Scouts of Texas Oklahoma Plains to sponsor the first Stage Write! – Playwriting for Girl Scouts workshop on Sunday, October 14, 2018. Renowned playwright and theatre collaborator, Allison Gregory, will lead the sold-out discussion in Circle’s theatre space. During the two hour workshop, girls in grades 4th through 8th will have a chance to complete steps in earning badges, and all participants will receive a patch for the event. Allison Gregory's plays for young audiences have been seen at some of the country's leading theatres, and include Go, Dog. Go!, adapted from the P.D. Eastman book and co-written with Steven Dietz; Even Steven Goes to War ("Zoni" Best New Script Award, AATE and UPRP awards, Kennedy Center New Visions/New Voices series); Peter and the Wolf (Footlight Award, Best New Play; National Tour with Childsplay, Inc.), Brementown Musicians and Junie B. in Jingle Bells, Batman Smells!. Her plays for adults include Forcing Hyacinths (Julie Harris Playwrighting Award, South Coast Repertory's California Playwright's Award); Fall Of Night (Garland Award, L.A.); Cliffhouse; Burning Bridget Cleary (Footlight Award, Best New Play, Seattle). She has received commissions from South Coast Repertory, ACT in Seattle, The Skirball-Kenis Foundation, Seattle Children's Theatre and Childsplay, Inc. 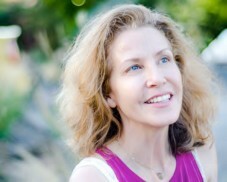 Along with her husband, playwright/director Steven Dietz, and her two children, she splits her time between Austin and Seattle. Founded in 1981 by Rose Pearson and Bill Newberry, Circle Theatre is currently producing its 37th season of live theatre in Fort Worth. Circle Theatre's mission is the advocacy of contemporary plays rarely seen in this community. Circle is committed to presenting professional, innovative theatre in an intimate setting. The Theatre is partially supported by the City of Fort Worth; the Arts Council of Fort Worth and Tarrant County; the Texas Commission on the Arts and the National Endowment for the Arts. Further support comes from the Amon G. Carter Foundation; Communities Foundation of Texas; Ann L. and Carol Green Rhodes Charitable Trust - Bank of America, NA; the Pangburn Foundation, JP Morgan, Trustee; the Sid W. Richardson Foundation; and The Shubert Foundation, Inc.
For further information, call 817.877.3040, from 12pm – 5pm, Tuesday through Friday.